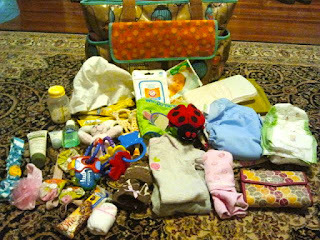 As my Über Kinder grows, so does my diaper bag [of doom]. I never realized how heavy it was because Joanna has grown (and gained) at the same rate as my upper body strength. I'm used to carrying her in one arm and my bag in the other, almost like a counterweight. 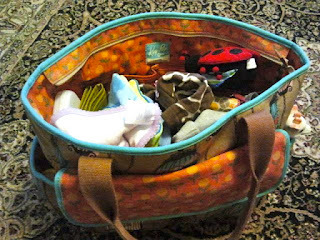 When I visited my grandmother, she offered to carry my bag for me. She let out a "woomph" as she picked it up by the straps. It wasn't until that moment that I realized that it may have some things that aren't exactly necessary?